As more and more Americans and their doctors seek alternative approaches to health care, isn't it time we offer our children the benefits of integrative medicine? 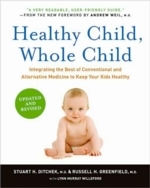 Written by two conventionally trained physicians, Healthy Child, Whole Child offers a new generation of parents the best of modern medicine and scientifically proven alternatives to aid their children's physical, emotional, and psychological health. Included are treatment strategies for the most common childhood diseases, sound advice about everything from television watching to herbal remedies, and the latest information on many of the hot-button issues -- including vaccines, antibiotics, and diet -- that have arisen in the past decade. Filled with compassion, common sense, and the knowledge of two experienced physicians (and parents) who understand the importance of treating the whole child, this book reflects the changing face of modern medicine. It is an invaluable resource for mothers and fathers who want the best for their children today, tomorrow, and for years to come.